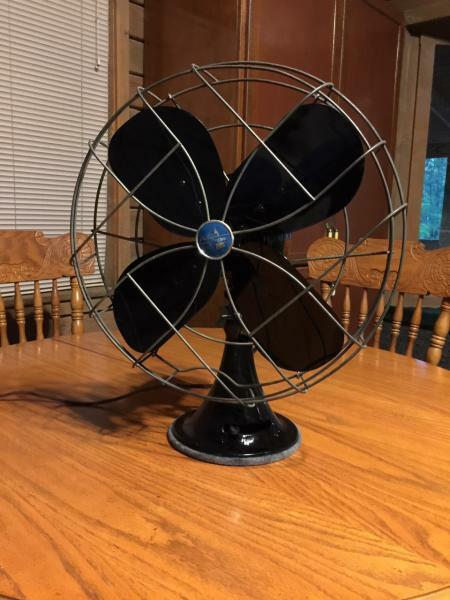 AFCA Forums > Antique Fan Collectors Association > Post-1950 (Vintage) > Emerson 79646-AX - Restored! It took a long time, but I have finally completed the 1952 Emerson 79646-AX resto I have started last year. The common consensus here is that it's a "low value" fan, so I took some minor liberties with it - mostly for esthetics . Big thanks go to Lane Shirey (speed selector decals) and Darryl Hudson (washers, bushings, shoulder screw). I made an effort to preserve as much as was practical of the original japanning, as well as the original power cord and plug. The base and the fan blades sadly were beyond saving, so they went for sandblasting and powder coating (high gloss and satin respectively). Since this particular fan is a "blue badge" version, I have decided to re-cover the base with the cloud blue felt vs original black. Also, an interesting observation - this fan has a cast iron base vs. more common aluminum one. WOW! Looks fantastic! Lane's decals are terrific! The blue felt ties in nicely with the badge! very nice, I really like the matching felt pad!! Thanks for the kind words guys about the decals, glad you like them! And yes, I also like the blue felt! That looks better than new! Nice restore job! I have a 16 inch but it dosent have time for a face lift. some day it will get refreshed. Thank you for the kind words, guys! Now I am more motivated to tackle the "facelift" on my Emerson 29646! A quick general question - if I have some japanning loss around the bottom of the base (up to 5/16" in some places), but the rest is fine, would you recommend keeping it original, or would this already be a candidate for recoating? Yes touch it up where it needs. Go figure! We almost have the same fan, but yours looks better than mine. Mine is a 1952 model 77648...16" version. I re-wired it, cleaned up the cage and badge and then gave it a shot of black enamel spray. I actually like the blue badge! It sits on a table on our balcony to keep us cool when soaking in the hot tub. Mississippi summers can be brutal. A side note for those considering powder coating - one has to take great care in covering the threads and mating surfaces very thoroughly - to clean up the "flashing" is a real bear, and requires a fair bit of work with an exacto knife and chasing taps... From personal experience. Page processed in 0.2342 seconds (36% database + 64% PHP). 28 queries executed.